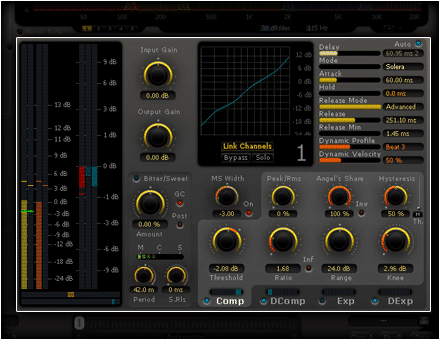 To perform the most detailed analysis of the material possible, a side chain section featuring a three-band equalizer for generating true frequency sensitive processing, as well as input options for an external sidechain signal, is provided. 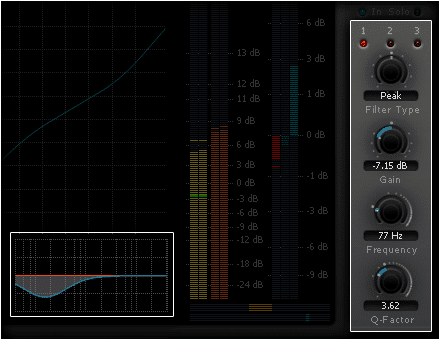 The external side-chain input is available in AU (Mac OS X) and AAX Native & DSP (Mac OS X & Windows) only. 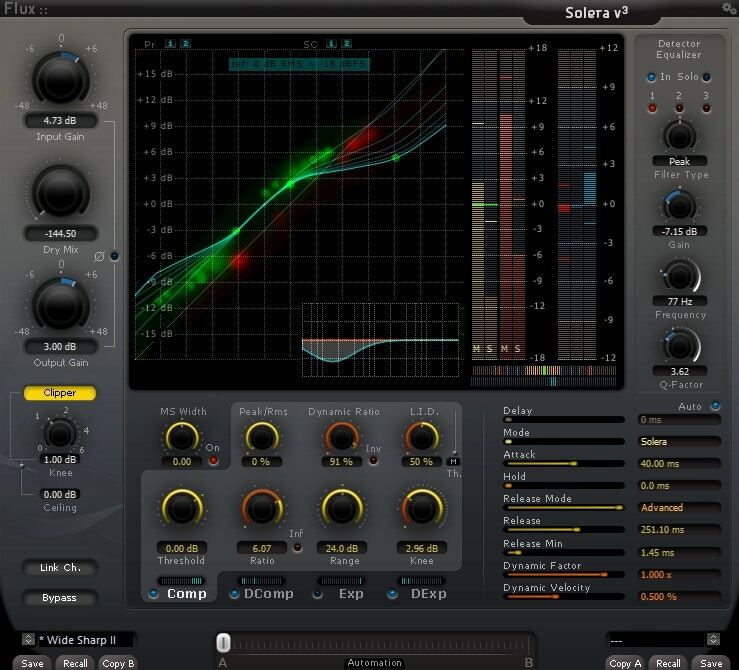 In addition to the common controls on a dynamics processor; ratio, attack, release, Solera offers control over the fundamental characteristics of the dynamics processing, all in order to provide full control over the processing even in the most demanding situations. 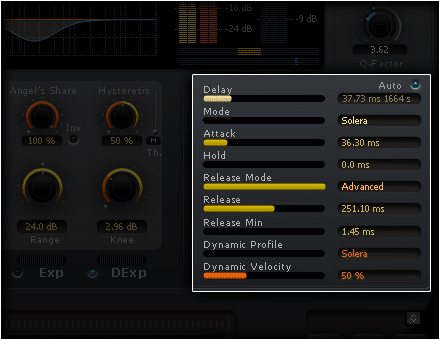 On each of the four dynamics processing sections two parameters are provided that are kind of unique to dynamics processing; Dynamics Ratio and Level Independent Detection (L.I.D), using the dynamic range content of the signal and not just the signal levels as standard processors do. 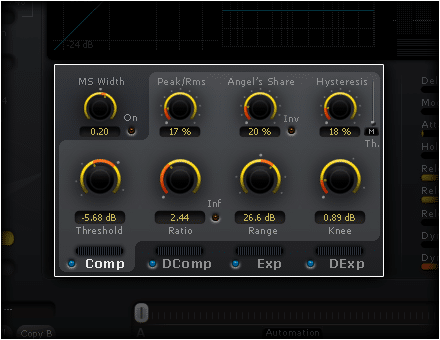 The MS Mode Control – Enables one MS encoding matrix at the input and one MS decoding matrix at the output of the dynamic processing in order to control the stereo width of the mix. 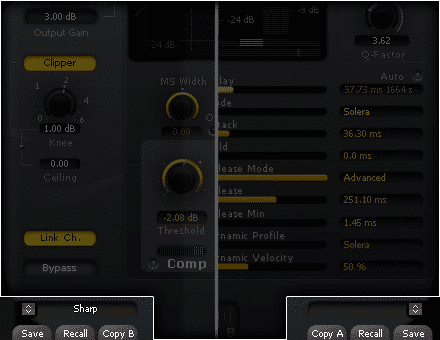 When engaged, the side chain is fed by a MS encoded signal that is reflected in the display section. M channel corresponds to the normal left channel. And the S channel corresponds to the normal right channel. 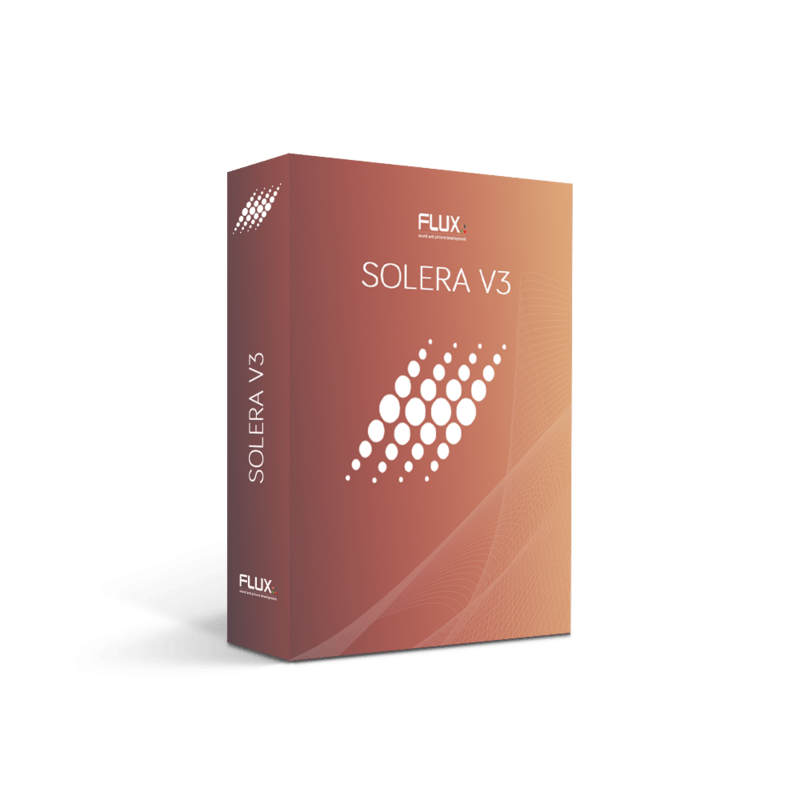 Comprehensive full band dynamics processing, powerful natural dynamics processing, preserve or recover the natural quality of the audio material without adding artifacts. AAX DSP Number of Solera v3 instances per dsp.